Therapain Plus is the ADVANCED AND ENHANCED VERSION of Therapain Spray. The PLUS version is much more effective and has a super concentrated 14,000 mg of Glucosamine and MSM. Neither of these are present in the "Therapain" version nor in any competitive product in this concentration. Why is Therapain Plus an Absolute Must? By breaking the cycle of pain, and providing raw materials for repair, Therapain Plus makes it much easier for your body's natural repair process to take place. WELL ABSORBED INTO PAINFUL AREAS THROUGH THE SKIN - Soothing non-staining spray-on pain formula. No more messy gels and lotions with thick waxy or silky feeling components that limit absorpsion. Lip balms and lipstick are good examples of substances that remain on the outside without being absorbed. Therapain Plus uses "liposomal nano-technology" (listed as a proprietary natural skin conditioner) to carry the healing ingredients through the skin into your sore spot, injured soft tissue and joint cartilage. FDA Registered Pain Reliever With No Intestinal Side Effects: Therapain Plus has been registered with the FDA as a pain reliever with the active ingredient of natural Menthol. Therapain Plus uses two percent natural menthol, enough for strong pain relief, but mild enough to feel comfortable upon application. You will feel a pleasant, cooling sensation at first, followed by warming pain relief without any burning, numbing or intestinal side effects. INGREDIENTS: As approved by the FDA, the active ingredient is Natural l-Menthol 2%. It also contains Isopropyl Alcohol; Water; 14,000mg of Glucosamine Sulfate and (MSM) Methyl Sulfonyl Methane; Peppermint; Eucalyptus and our unique Liposomal Nano-technology (this is a natural, highly absorbable skin conditioner that functions to carry the active ingredients below the skin into muscles and joints). 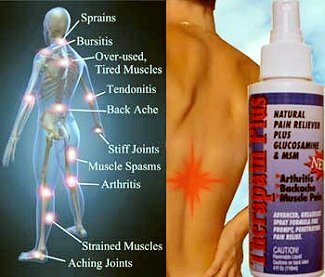 One spray contains 14,000mg of Glucosamine and MSM. No other product even comes close to this concentration of these healing ingredients. WHAT IS THE RATIONALE FOR GLUCOSAMINE SULFATE? Joint pain is often attributed to the destruction and deterioration of joint cartilage. In cases of spinal disk generation or degerative osteoarthritis, cartilage cells have died due to loss of water content and appropriate nutrients. Unfortunately, this situation is perpetuated by lack of motion in the joint due to pain. The Progession Occurs as Follows: 1) pain limits movement 2) this lack of movement causes degeneration of cartilage 3) unhealthy cartilage further limits motion 4) limited motion increases pain and inflammation. It's a vicious cycle of pain. Healing begins by breaking this cycle of pain and the high concentration of glucosamine in Therapain Plus is a proven friend in that regard. In numerous studies glucosamine has demonstrated proven potential to rebuild joint cartilage. Most studies have been done on the molecular form called glucosamine sulfate. This is a very small molecule and thus is easily absorbed through the skin. Chondroitin sulfate is also greatly beneficial because it helps increase lubricating joint fluid. The good news is that glucosamine sulfate is easily converted to choindroitin sulfate in the body, so we really don't have to worry about adding it to the mix. Does this help you to see how the body uses nutrients to heal itself? Glucosamine is very well tolerated by most everyone. WHAT ARE THE BENEFITS OF MSM? Methyl Sulfonyl Methane is a naturally occuring sulfur based molecule found in all living things. As a matter of fact it makes up a large component of our bodies. Please note that the sulfur found in MSM is in the form of a sulfonyl and is healthy for us. It is nothing like dangerous sulfa drugs or allergy inducing sulfites found in wine and as a food preservative. MSM has been shown to add flexibility to cell membranes, allowing fluids to pass through the tissue more easily (please note that lack of water in cartilage is a key component of destruction). Thus MSM brings water into the cartilage cells carrying nutrients and more lubrication to the joint. It appears that MSM is not well absorbed topically unless it is combined with other high absorbable ingredients. Our glucosamine sulfate and liposomal nano-technology addresses such absorption issues. MSM has also demonstrated anti-inflammatory and pain reducing properties, helping to block pain signals in nerve fibers. Some authoritative studies suggest that MSM may also reduce scar tissue by altering the cross linking process in collagen to allow tissue repair and healing to take place. Therapain Plus Spray® 4 fl. oz. MONEY BACK GUARANTEE: Daily use of Therapain Plus for 2-3 weeks should offer relief of your pain. Try it for up to 30 days and if not totally satisfied, then send back any unused portion for a full refund of the product purchase price. PROFESSIONAL USE: chiropractors, medical doctors, physical therapists and massage therapists can apply to painful, spasms and sensitive areas prior to dispensing their professional treatment. Thermotex Tts Platinum Far Infrared Heating Pad | Multi-use - This infrared therapy, produces far penetrating heat for home and professional use, making it the most versatile, safe and FDA-approved deep heating pad.